Final Fantasy Record Keeper is an iOS/Android game that takes characters and creatures from almost every main numbered Final Fantasy game and lets your create your own party to fight against those creatures. In short, it's a game for Final Fantasy fans who really love the old-school combat from the earlier games. Combat in Final Fantasy games wasn't always flashy teleporting gimmicks and next-gen prettiness. There was a time when it was strategic turn-based commands with 2-d sprites – and Final Fantasy Record Keeper has those aplenty. In Final Fantasy Record Keeper, you play the part of a young apprentice in a mystical archive that contains all the history of the Final Fantasy games. A dark force clouds the magical tapestries and you are tasked with entering the tapestries to reenact historical events from the various Final Fantasy games. You start off with the beginning events of Final Fantasy VII, but by clearing the tapestries, you are granted access to other tapestries and other Final Fantasy games/worlds as well as unlocking characters from each game. Each tapestry is divided into segments of combat where you have to fight a certain number of times before moving on to the next segment. Each tapestry will have at least one boss that you have to defeat. There is a stamina bar that gradually refills in real time. Progressing through a tapestry costs stamina, so there is only a limited amount of play you can get out of a single sitting unless you use special stamina-replenishing items, obtainable both through in-game means and with money. Each Final Fantasy game has always had a different combat system, but Final Fantasy Record Keeper unifies them all with a very basic Active Time Battle (ATB) combat system with 2D sprites. Each character has a meter that gradually fills and when filled, the character can execute a command. What's different about Record Keeper and, say, Final Fantasy VII is that there is also a time delay between when a command is entered and when it is executed. Each character can equip up to 2 abilities, be they white magic, black magic, summons, or other special attacks. Each ability has a limited number of uses that can only be replenished by either leveling up or by exiting a tapestry. Of course, exiting a tapestry before clearing it nullifies your progress, forcing you to start from the beginning of that tapestry. Initially, the combat itself is exceedingly easy to the point where the only way to lose is to put your phone down and walk away for about an hour while the enemies chisel away at your characters' HP. The bosses can require a bit more creativity, but in the early stages of the game, it's basically a pattern of hitting "attack" over and over until you reach a boss and then unleashing all of your special attacks on it. The later stages can pose much more of a challenge and there are limited events and daily dungeons to keep things fresh. Boiled down to its core, Final Fantasy Record Keeper is if you took all the numbered Final Fantasy games, smushed them together, took out all of the story events, and left only the combat. It's simplistic and light-hearted so if you're looking for an engaging complex game with a deep story, this is not the game for you. The only main numbered games not included are FFXI and FFXIV, though due to the nature of Record Keeper's system, it doesn't seem like it would be too difficult to incorporate enemies and characters from both. If anything, this is a game for Final Fantasy fans who have an emotional attachment to the characters. At its best, it's fun fantasy fulfillment. You get to create a party of your liking from your favorite characters and have them fight against enemies from different games. Just the thought of that tickles my inner fanboy. 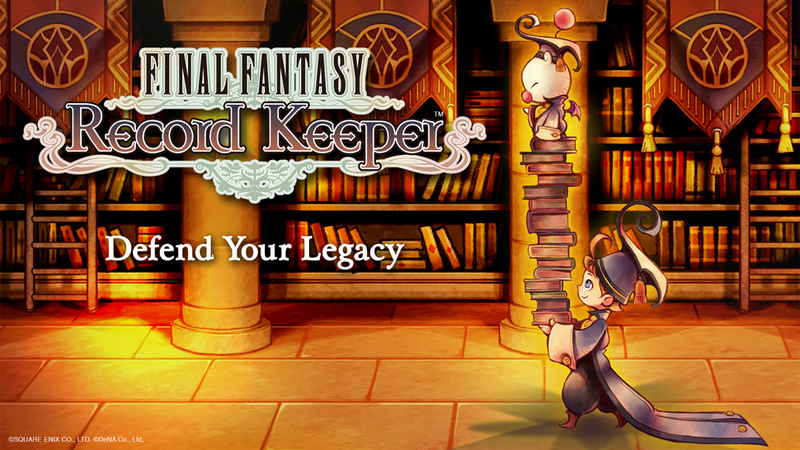 Final Fantasy Record Keeper is available for iOS and Android platforms in Japanese. An English version is scheduled for release in the West this Spring. The game is free to play with payable elements.